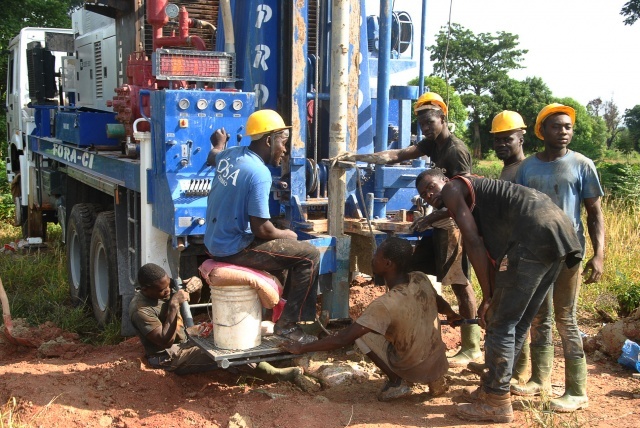 Workers drill a well on April 20, 2018, near Bouake, which has been suffering from a water shortage for three weeks due to the reservoir which provides 70 percent of the city's water being dry. For months the world was told Cape Town in South Africa would be the first city in the world to run out of water but with a daily water ration of 25 litres (6.6 USA gallons) allowed per day (single toilet flush uses nine litres) Cape Town's "Day Zero" has been put back to some time next year. Thousands of kilometres (miles) away, another African city has had far less luck -- and much less attention for its ordeal. According to afp.com, located in grassy savanna around 400 kilometres (250 miles) from the Ivorian economic capital of Abidjan, Bouake is a city of more than half million souls, with a million more in surrounding territory. The area has been hit by a double whammy. The dammed lake that supplies 70 percent of the city's water has run dry. One factor is an unprecedented drought that has gripped the region -- a phenomenon in line with expert warnings about climate change. But another, says the territory's director for water affairs, Seydou Coulibaly, is the impact of unregulated sand quarrying, which has altered the course of waterways feeding the reservoir. "We are struggling to get clean water for drinking and cooking," computer technician Eliezer Konan told AFP. "Washing has become difficult. It's a real ordeal." In a bid to bring some relief, the city has begun drilling wells to obtain fresh water. But that is not a long-term solution for everybody. "Even the wells start to dry up when lots of people rush for water," said Amoin Konan of the Ahougnanssou district.